Ryuku Islands. Photo by Yoshitaka Tahara. An international team of scientists led by Dr Kate Sanders from the University of Adelaide, and including Dr Mike Lee from the South Australian Museum, has uncovered how some sea snakes have developed 'shrunken heads' - or smaller physical features than their related species. 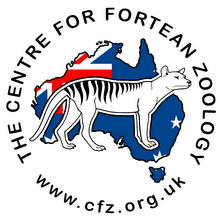 Their research is published today in the journal Molecular Ecology. A large head - "all the better to eat you with" - would seem to be indispensable to sea snakes, which typically have to swallow large spiny fish. However, there are some circumstances where it wouldn't be very useful: sea snakes that feed by probing their front ends into narrow, sand eel burrows have evolved comically small heads. The team has shown normal-shaped sea snakes can evolve such "shrunken heads" very rapidly. This process can lead to speciation (one species splitting into two). The small-headed populations are also much smaller in absolute size than their ancestors, and these shape and size differences mean they tend to avoid interbreeding with their large-headed ancestors. Dr Lee says, "A team led by my colleague Dr Kate Sanders (University of Adelaide) has been investigating genetic differences across all sea snakes, and we noticed that the blue-banded sea snake (Hydrophis cyanocinctus) and the slender-necked sea snake (Hydrophis melanocephalus) were almost indistinguishable genetically, despite being drastically different in size and shape. 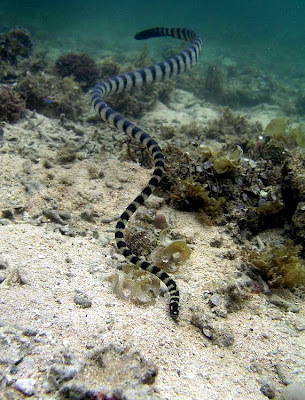 "The slender-necked sea snake is half the size, and has a much smaller head, than the blue-banded sea snake. "This suggested they separated very recently from a common ancestral species and had rapidly evolved their different appearances. "One way this could have happened is if the ancestral species was large-headed, and a population rapidly evolved small heads to probe eel burrows - and subsequently stopped interbreeding with the large-headed forms." Dr Sanders says the research could have wider implications in other scientific studies: "Our results highlight the viviparous sea snakes as a promising system for studies of speciation and adaptive radiation in marine environments." Michael Rothman for Ace Coinage. University of Adelaide researchers have found the answer to one of natural history's most intriguing puzzles - the origins of the now extinct Falkland Islands wolf and how it came to be the only land-based mammal on the isolated islands - 460km from the nearest land, Argentina. 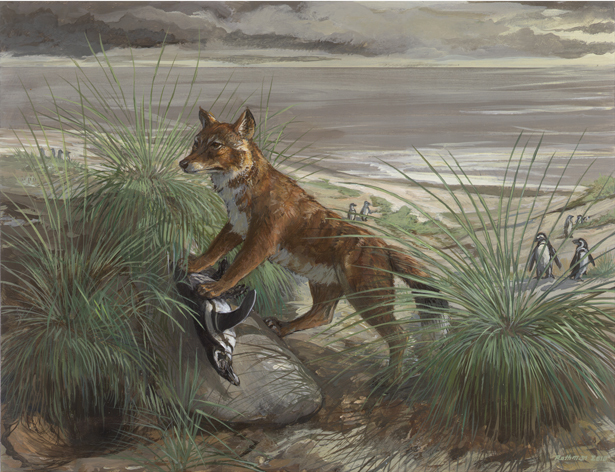 ACAD's analyses showed that D. avus was the closest relative of the Falkland Islands wolf and they separated only 16,000 years ago - but the question of how the island colonisation came about remained. 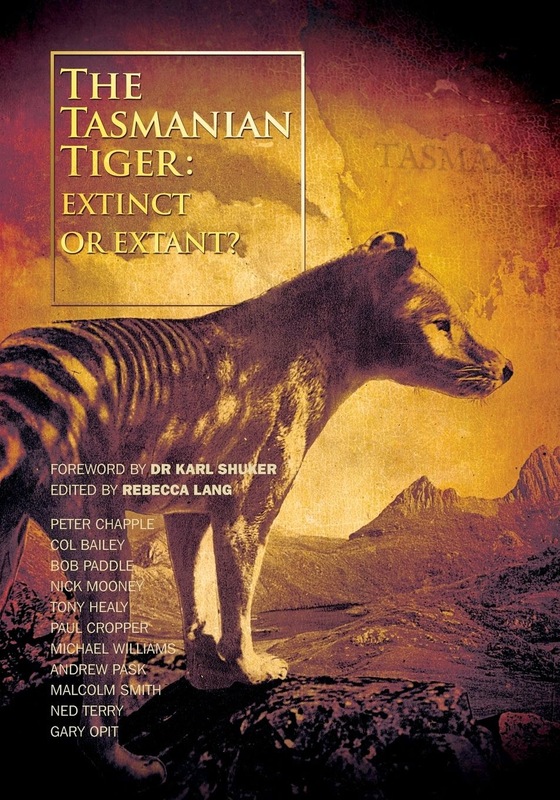 The absence of other mammals argued against any land bridge connection to the mainland.